I often get asked what the best method is for removing nail polish from carpet. We all know how easy it is to knock over that bottle of polish or drop the brush right after we dip it in the polish. 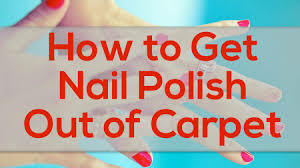 Below I am going to walk you through the best process for getting all of that nail polish up without leaving a stain or damaging your carpet in the process. 1. Act Immediately. The longer you allow the polish to sit on your carpet the greater the chance for a stain to form. 2. Blot. We all get the same idea in our heads when we see a spot on the carpet, rub it until it is gone, but this will harm your carpet instead of getting the polish out. 3. Remove the excess. Before you apply the cleaner, remove as much of the polish by blotting it with a towel. 4. Test. Before you load your carpet with polish remover, dab a little on the edge to make sure it isn’t going to damage your carpet. 5. Remove. After you have tested a non-acetone nail polish remover, you can now blot up the stain and polish slowly. If you have darker carpet, you may have to use rubbing alcohol or hair spray. 6. Rinse. Once the stain if removed, rinse the area with water and dab it dry with a cloth. No matter what item gets spilled on your carpet, always call Golden Glove to provide a deep professional cleaning to make sure there are no unseen stains or moisture lurking under the surface.